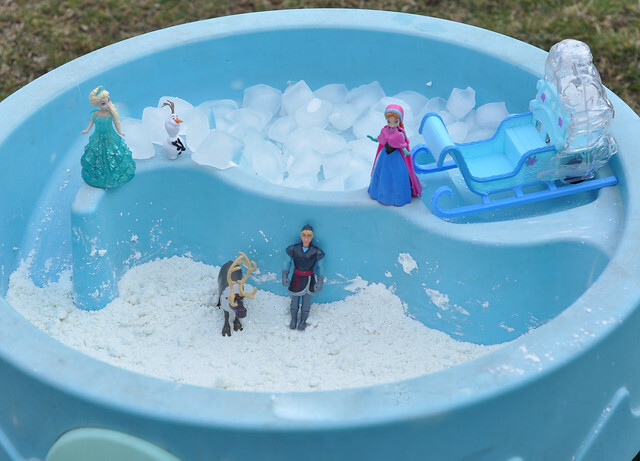 Like most of the world, Frozen is a big deal in our home. 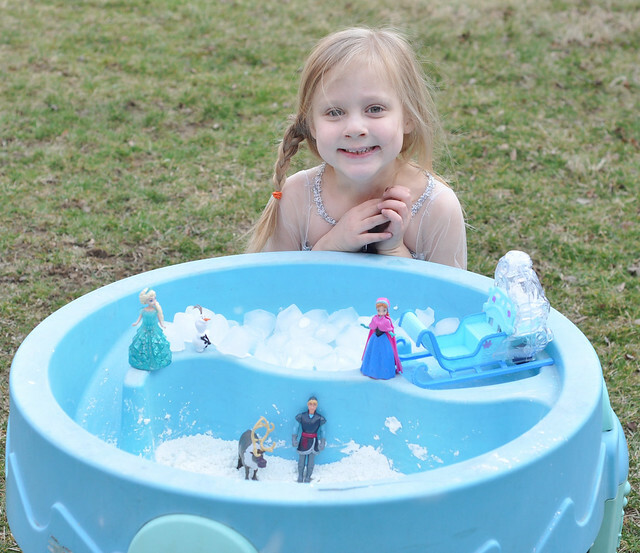 Lily fell in love with Frozen when she was 2, and her obsession is still going strong. I'm not quite sure she will ever let it go! Over a year ago, we bought tickets to Disney on Ice Frozen. FINALLY, the big day is here! Lexie, Lily and I will be heading into Pittsburgh later with some of our best friends for the show. Lily is incredibly excited! 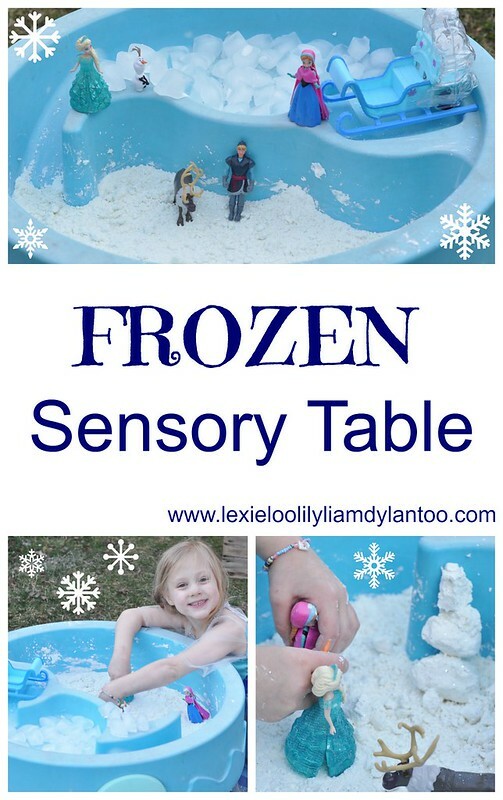 In honor of the big day, I put together a Frozen Sensory Table for Lily to play with yesterday. 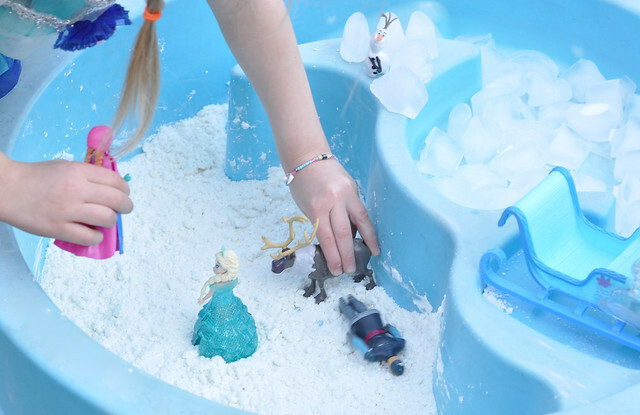 We made homemade snow before, but the kids really enjoyed playing with a snow filled water table at birthday party last summer. 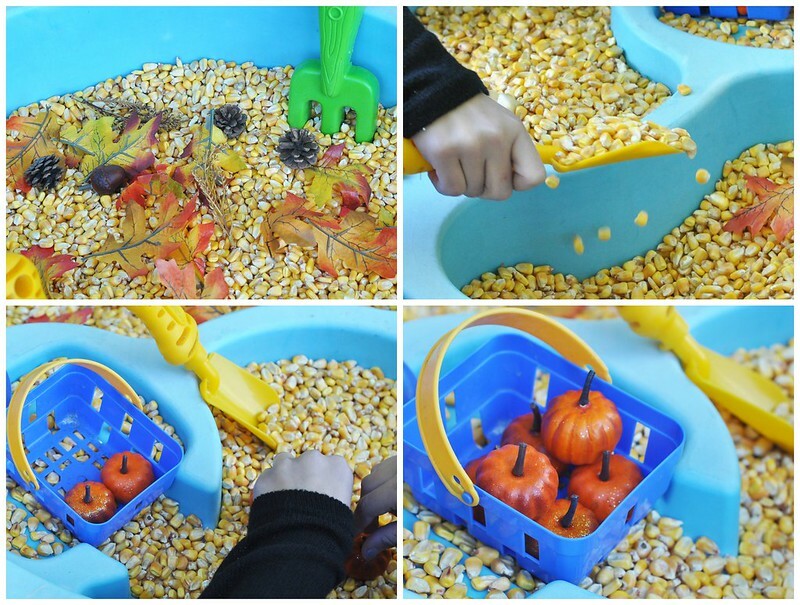 I combined that idea with another sensory table filler. Much to Liam's dismay, I dumped out the bird seed, took the table outside, and got it ready for Lily. This idea has been on my editorial calendar for many months, but I wasn't counting on the fact that it would be a nearly 75 degree winter day yesterday! 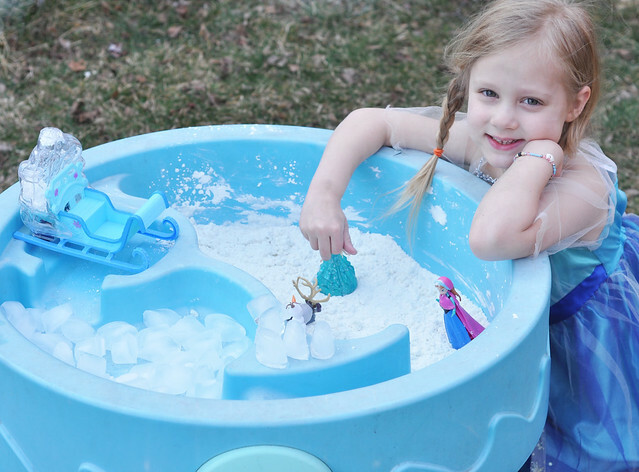 Lily was still able to play for an hour before things became, ahem, a little less Frozen! 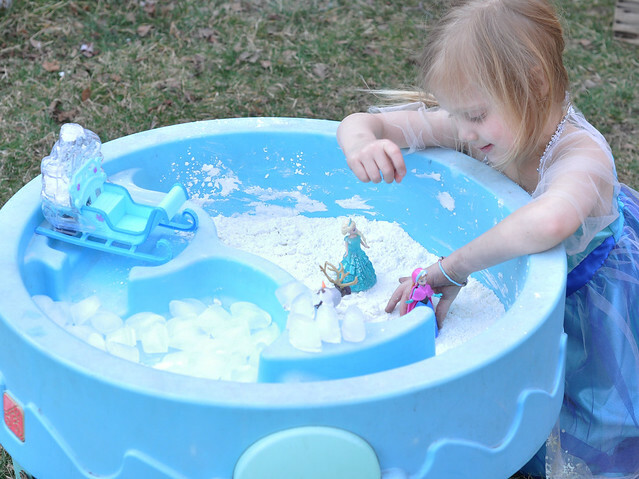 To make the Frozen Sensory Table, all you need is a recipe for homemade snow, some ice cubes and a few toys. 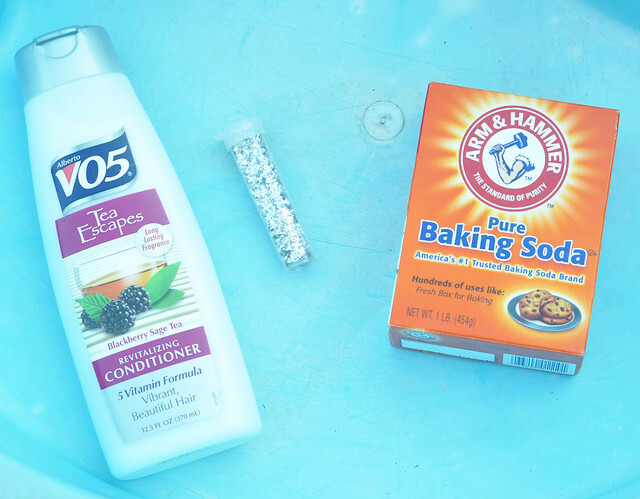 Everybody has a different recipe for homemade snow (some use shaving cream and baking soda), but we like to use 3 boxes of baking soda, a container of glitter, and a bottle of inexpensive (white) conditioner. 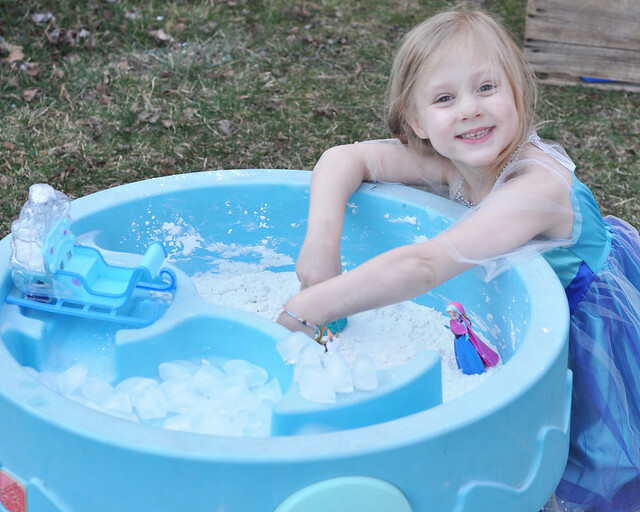 For the ice, I dumped 4 trays of ice cubes into the other side of the water table. If you are brave, you can dye the ice cubes blue, purple, or even a rainbow of colors, but I didn't want to deal with dyed fingers this week! Finally, it was all ready for play! 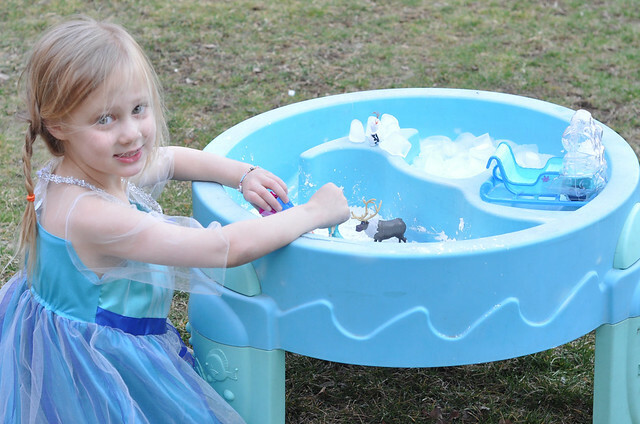 I told Lily to put on her Elsa dress and get ready for some fun. She had no idea, so she was so excited when she walked outside! She wasted NO time digging in and it kept her occupied for an hour! 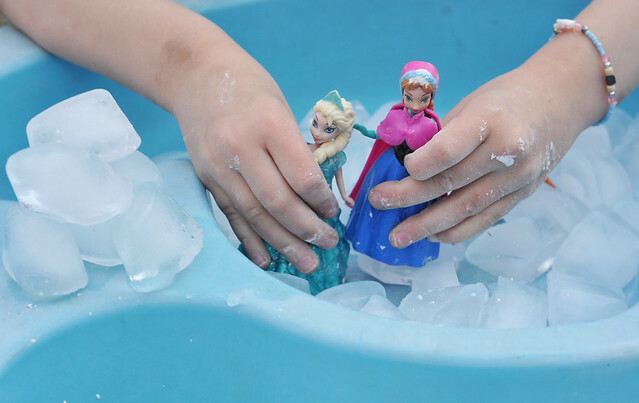 You can even build a snowman (HA) and stack up those ice cubes to make an ice castle! After an hour, the ice was nearly melted and Lily was ready to run around. We put the snow into a storage container so the kids could play with it for a few days, and dumped out the ice. 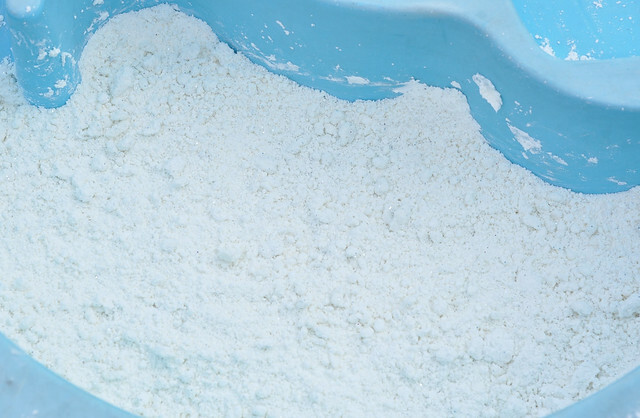 Unlike some of our other sensory bin fillers that can stay in the water table for days, this one does need cleaned up, but clean up is easy! 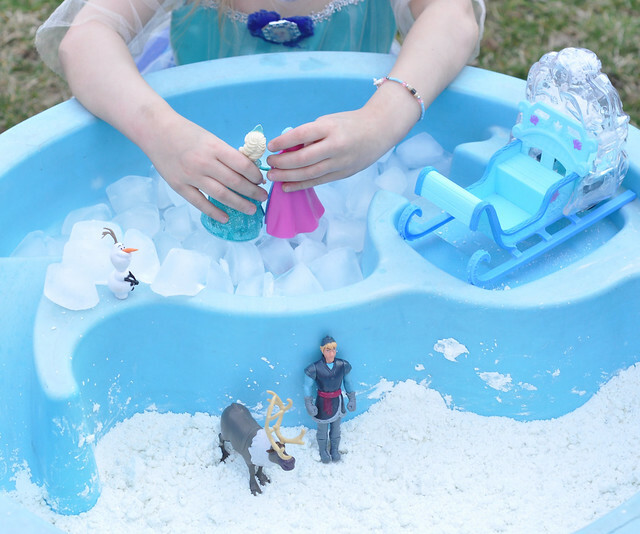 Lily had so much fun with her Frozen-inspired Sensory Table and said she can't wait to play again! 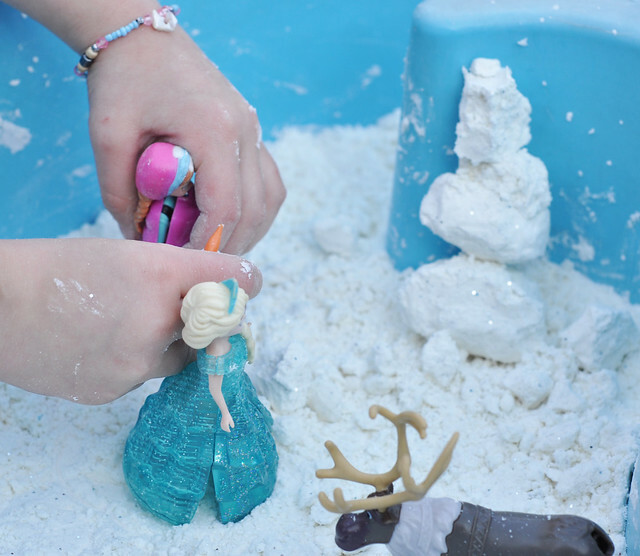 Do your kids like Frozen or enjoy sensory play? We love Frozen, too! This is so cute! I bet they would love it! Even Lexie, at age 9, still enjoys it! I LOVE this! What an awesome idea!! Such a fun idea! I love that she even came in costume too :). Thank you! She has plenty of Elsa outfits to choose from. Haha! This is amazing!!! 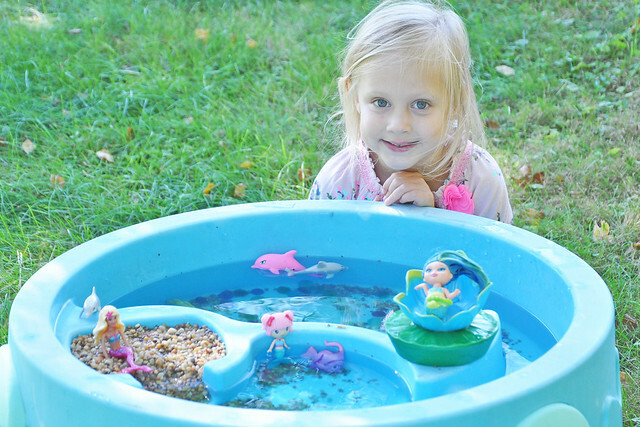 Love all your water table creations! What brand water table is this? Its the perfect size. Thank you so much! XOXO It's the Step 2 water wheel table. Dylan got it 10 years ago, but they still make it!